Former U.S. Attorney General can be sued by a man who claims he was illegally detained. 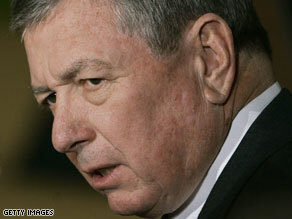 (CNN) - Former U.S. Attorney General John Ashcroft is not immune from being sued by a man who claims he was illegally detained under Justice Department policies implemented after the September 11 terror attacks, a federal appeals court ruled Friday. The man, a native-born U.S. citizen who was once a college football star, was held and interrogated by the FBI for 16 days in 2003 and his travel was limited for another year, court documents said. A spokesman for Ashcroft, asked for his reaction, told CNN, "We're reviewing the decision and have no further comment." The court rejected Ashcroft's argument that his involvement was as a prosecutor, which would give him full immunity from lawsuits - not as an investigator, which could leave him liable. "We disagree," the decision said. "Many tools and tactics available to prosecutors can serve either an investigatory or advocacy-related function." Abdullah al-Kidd's lawyers claimed Ashcroft developed a policy under which the FBI and Justice Department would use the federal material witness law as a pretext "to arrest and detain terrorism suspects about whom they did not have sufficient evidence to arrest on criminal charges but wished to hold preventatively or to investigate further." His arrest warrant was based on an FBI affidavit that said he was needed to testify at the trial of a Saudi man who had been indicted on visa fraud. Al-Kidd was never called as a witness in that case, in which the defendant was acquitted, court documents said. The decision said that "al-Kidd's arrest functioned as an investigatory arrest or national security-related pre-emptive detention, rather than as one to secure a witness's testimony for trial." Al-Kidd - an African-American born in Wichita, Kansas - converted to Islam and changed his name from Lavini T. Kidd, according to court documents. He was taken into custody at Dulles International Airport in northern Virginia as he prepared to depart to Saudi Arabia, where he planned to study Arabic and Islamic law, the documents said. The FBI interrogated him, moving him from Virginia to Oklahoma and then Idaho, court documents said. He was kept in chains while being held in high-security cells that were lit 24 hours a day, his lawyers claim. A judge ordered his release 16 days later, but he was required to surrender his passport and stay in Nevada for another 15 months. During that time, he lost his job with a government contractor - because he could not get a required security clearance. The father of two also lost his wife, who divorced him. The FBI began watching al-Kidd months before detaining him, as part of their anti-terror probe aimed at Muslim men, his lawyers said. When agents learned of his plans to fly to Saudi Arabia, they obtained the "material witness" warrant based on their contention he would not return. had previously cooperated with the FBI, his lawyers said. They also told the judge he had a one-way ticket, when he actually held a round-trip ticket, they said. –CNN's Carol Cratty contributed to this report. This is an excellent decision. Our constitution promises FREEDOM from unwarranted searches and seizures. The sort of thinking and action on the part of government that endeavors to take away our constitutional rights to save our constitutional rights is the worst kind of constitutional violation and is a serious threat to our constituion. This behavior should always be vigorously challenged. Special hearings, fact finding, sue and arrest. What a nice party line. This is the sort of thing that can happen if you allow torture and illegal searches on non-citizens. Someone gets the bright idea that they can do the same thing on citizens. Are you folks absolutely certain that minorities don't know when to pull strings, push buttons, and then cry foul when anyone pushes back? You know? Isn't it entirely possible that they have the press and other media like entertainment in their back pockets. Those people in the press and entertainment aren't exactly specimens of physical prowess who would stand up to a bully . . . even if they could. And they also are not restricted by law to not accept bribes or make deals with assorted agenda. And then the government (police) are always into a discovery phase while saddled with some love song that says the opposite of what they're encountering cannot possibly be the truth. Listen up, listen up – The WH is thinking about drafting its own ObamaDeathCare # 2 (ObamaDeathCare #1 under the bus with Race Baiter Van Jones) but the teleprompter is on vacation and not due back until 9/12. Stay tune for "Death Panels" number 2. That whole Admin. should be in PRISON for DEATH. After all the things they have done to the world for 8yrs, murder, invasions, robbery, racial profiling, lies and some of everything you can think of, they have committed it. I believe it is alright to point out how CNN should be more equal and fair about reporting the news. Perhaps this statement will be printed since the other was not. It is getting extremely tiresome, this constant attack against the Bush administration. It seems the left is so overly obsessed it cannot get on with the job they have in front of them. But again they will attempt any distraction to get the public eye away from this health care takeover attempt. What they don’t get is they are wrong and the public knows it, NO MORE SMOKE AND MIRRORS Obama. Ashcroft says he was a prosecutor in 2003? Prosecutors litigate cases IN COURT. When was the last time Ashcroft prosecuted a case in court? Probably in the 1960's. Ashcroft is guilty as sin of profiling and detaining innocent Americans without regard to the law. I had never heard of this arrest, detention and restriction of travel on this citizen. At this point, I would have to assume that the arrest was made for what was deemed to be good reason, at the time. Since the man was, presumably released and the charges dropped, I believe that the court's decision to allow the lawsuit is warranted. Having said that, however, I opine that,if the court is able to establish that the arrest was made in good faith, because there were elements that aroused suspicion and alarm, then it should rule for a reasonable negotiated out-of-court settlement to compensate the man for lost wages and attorney's fees, given the final outcome. The court should also try to establish if the arrest was "unnecessary harrasment and abuse of power" by Mr. Ashcroft as a citizen against another citizen. If that were found to be true, then Mr. Ashcroft should be made to compensate the man. If, on the other hand the court finds that Mr. Ashcroft had no idea who the man was, but was simply fulfilling his duty to protect us against enemies of the state, then the court should dismiss the case against Mr. Ashcroft. Overall, I find it healthy that these kind of actions have some sort of review and oversight and we should draw lessons form them for the future. More evidence that the church age has come to an end. May God have mercy on those responsible for treating this man - and untold others - in such a despicable way. They are going to need it. I agree with the liberals. Anyone who tried to keep America safe during a time of terroristic threat such as the aftermath of 9/11 is definitely a criminal. Let's roll out the welcome mat to more radical muslims and I'm sure we will all be safer. Of course: anybody can be sued. Can one bring legal action and prevail in a case like this? If so, the world has come to an end. This is a time of war. Unfortunate consequences occur when nations are attacked by terrorists; there are inconveniences. They are the stuff of great movies. This suit is very Casablanca.